Published in The Market magazine, June 2012. Original article here. Over 800 million people drop by YouTube every month, looking for music videos, film trailers and funny clips of cats in boxes. The online video pioneer is unsurpassed when it comes to bringing the world an abundance of dogs on skateboards, but still it is perhaps no surprise that YouTube wants more. There is certainly lots to come: since the 2011 confirmation that the group will be launching original content channels, hardly a week seems to go by without an announcement of newness from YouTube. ‘TeamUSA’ is one of these new channels, themed to the 2012 Olympic games. The parent group of the Tribeca Film Festival will make another channel, while ‘Life and Times’ is masterminded by rapper Jay-Z. Another is ‘Wigs’, created by ‘Black Swan’-producer Jon Avnet, to feature scripted dramas; this provides another example of how YouTube has included a number of big names in its new venture. Other channels include the ‘Red Bull’ action sports channel, ‘American Hipster’, ‘Young Hollywood Network’, and ‘My Damn Channel’ which broadcasts live comedy from established and emerging talent. The list goes on, and on top of this, YouTube has signed deals with film producers Paramount, Sony, Warner Bros and Universal to offer pay-per-view film streaming. Having pledged to spend over $200 million to market the new channels, YouTube is clearly dedicated to this shift towards quality programming. One reason this has become relevant is because technology lets us feed the internet into our television sets, meaning we can watch YouTube channels from the sofa. 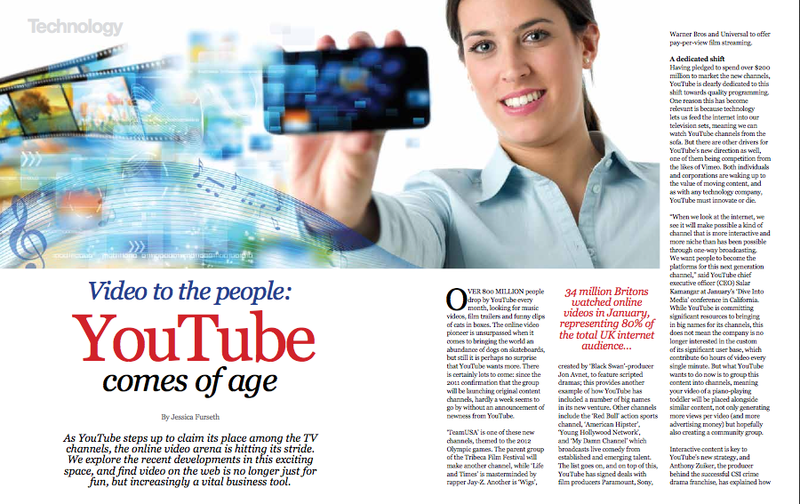 But there are other drivers for YouTube’s new direction as well, one of them being competition from the likes of Vimeo. Both individuals and corporations are waking up to the value of moving content, and as with any technology company, YouTube must innovate or die. “When we look at the internet, we see it will make possible a kind of channel that is more interactive and more niche than has been possible through one-way broadcasting. We want people to become the platforms for this next generation channel,” said YouTube chief executive officer (CEO) Salar Kamangar at January’s ‘Dive Into Media’ conference in California. While YouTube is committing significant resources to bringing in big names for its channels, this does not mean the company is no longer interested in the custom of its significant user base, which contribute 60 hours of video every single minute. But what YouTube wants to do now is to group this content into channels, meaning your video of a piano-playing toddler will be placed alongside similar content, not only generating more views per video (and more advertising money) but hopefully also creating a community group. Interactive content is key to YouTube’s new strategy, and Anthony Zuiker, the producer behind the successful CSI crime drama franchise, has explained how he will incorporate viewer feedback into his YouTube channel. Another way for people to engage when watching sports is to choose which camera to view a game through, or eventually even have a say in what the coach does next. Niche content is another buzzword for YouTube, whose channels aim to enable broadcasters engaging viewers in a unique way. 34 million Britons watched online videos in January, representing 80% of the total UK internet audience, according to digital research group ComScore. ComScore found the size of the video viewership to have remained stable in the past six months, however people are watching 28% more videos than before and spend 42% more time on them. This suggests not only that online video usage is a major trend, but also that people are migrating towards more engaging content. “Like everything else on the web, online video is about content. It is easy to fixate on the hub [such as YouTube], but it really is all about the content. Take Facebook for example: you do not use it because it is nice, you use it because all your friends are there,” says Suranga Chandratillake, founder and CEO of Blinkx, a London-listed search engine for video and audio content. Blinkx is a spin-out from British success story Autonomy, which last year was bought by Hewett-Packard for over $10 billion. While YouTube’s business is based on hosting, Blinkx’s focus is on search to help people find visual content, be it from YouTube or elsewhere. “YouTube grew fast in the early days, as it was the only place you could really get content. Now people watch things from other sources, such as Netflix and iTunes,” explains Chandratillake. “So things are different now. One moment you will be watching an episode of The Sopranos on Netflix, then next a cute kitten on YouTube. Both platforms matter, as people will go to the one that has the content they want.” He points to streaming site Hulu as a hub that was initially chastised for its poor interface, but eventually succeeded because it was able to offer popular videos. “YouTube has realised that to generate and keep a large audience they need better content,” says Chandratillake when asked about YouTube’s decision to create original programming. The trouble, however, is that creating your own material is notoriously difficult. The AOL Time Warner merger, which the company itself has admitted was a big mistake, is a cautionary tale of just how wrong it can go when a platform company tries its hand at creation. Netflix is now working on its own programming, but the jury is out on how successful this has been. While YouTube has managed to secure alliances with entertainment companies to show films, Chandratillake points out that this is unlikely to be massively profitable for YouTube; he who owns the content gets a significant slice of the money pie. This also goes a long way to explain why YouTube ultimately wants to own this part of their business too. Attracting the big viewing crowds is key to generating any significant advertising money, but the online video trend has not gone unnoticed by business users. Consequently, YouTube and its peers are finding an increasing number of customers willing to pay for professional services. Making an engaging video and putting it on YouTube is one thing, but companies need to get people to see them. 81% of marketers are now using online video, according to the Web Video Marketing Council, and the majority will combined it with email, websites and social networks. Howell believes social media is a natural fit for online video, providing a great way to ensure a video travels beyond the reach of the company website. “Also, social media allows audiences to interact with a video, whether that is through comments or by video replies; in fact the latter is often a way to further engage an audience and create more value for a video.” The proliferation of smartphones and tablets is an increasingly important driver for online video: nearly two-thirds of smartphone owners have watched video on their device, according to a survey from In-Stat. This number is even higher on tablets, where 86% of users have watched videos. For a corporation, making online video can be viewed as pure advertising, but technology has come a long way in allowing them to track how people are interacting with online services. “This year, more companies are asking the right questions. They are detailing who is watching and sharing their videos, delving into the demographics, optimising in real time and monitoring sales uplift and benchmarking results,” says Howell. The same principle holds true for the advertisers, which are having to find new ways to interact with discerning internet users who will hit the “skip” button on ads they do not want to watch. “Users expect ads they want to watch,” said YouTube’s Kamangar, a sentiment echoed by Blinkx’s Chandratillake: “Instead of focusing on the performance of ads, where you pay per click or view, Blinkx focuses on brand-driven ads which are visual and emotive.” A key feature of the Blinkx software is the ability to recognise content and meaning from audio and video, enabling the group to place only relevant advertising alongside the content. A key competitor for YouTube is Vimeo, traditionally the choice of a more discerning user base such as independent filmmakers and graphic artists. But last year’s launch of Vimeo Pro ensured the platform has become a serious contender for business customers. “We look at the space for professional video hosting as two extremes. There is the free services with limitations, and there is the other extreme of the professional services which tend to be very expensive. Our goal is to fill the void in the middle,” Vimeo general manager Dae Mellencamp said on ‘The Roadmap’, an online programme focusing on technology innovation. For only $200 a year, Vimeo Pro users will get 50 gigabytes of storage, enough for 500 five-minute high-definition videos. This should cover 99% of people’s needs, asserted Mellencamp, explaining how the service will give users the freedom to use their own company branding; a corporate Vimeo account will look like it is owned by the company and not just an extension of Vimeo. Private links are also possible, so if a group like a doctor’s surgery wants to use Vimeo they can make videos that go out only to their patients. YouTube offers custom-branded channels as well, but the pricing is much less straightforward and closely linked with advertising spend. Companies will need to contact YouTube for price quotes, but the cost will likely start at four figures and go up from there. This means Vimeo should be able to carve out a niche here. “I have the impression companies are increasingly choosing Vimeo over YouTube for their business videos,” says Blinkx’s Chandratillake. Vimeo is still small compared to YouTube, but the Goliath will likely be keeping an eye on Vimeo’s David; the latter has been praised for placing the user experience at the forefront with an uncluttered interface that avoids pre-roll ads. This tactic paid off when Apple chose Vimeo, not YouTube, as its partner for the new Mountain Lion operating system. Still, YouTube looks to be pretty wholeheartedly focused on creating its own content, meaning there will likely be room for several operators in the various niches of the online video market. One thing is certain: as this arena grows at a rapid pace, the race is on for the participants to stake out their claim on this brave new world. Posted on 06/10/2012 by Jess. This entry was posted in Business features, Technology features. Bookmark the permalink.